More Vermont parents are losing their children in custody battles with the state — a debilitating side effect of Vermont's opioid-abuse crisis. Petitions for "termination of parental rights" increased 61 percent between 2011 and 2015, from 208 to 335 cases annually. When state prosecutors take that final legal step, they almost always win. Last year, courts approved 88 percent of their petitions. A significant number of those cases go all the way to the state Supreme Court, at which point the details — minus proper names — end up in the public record. 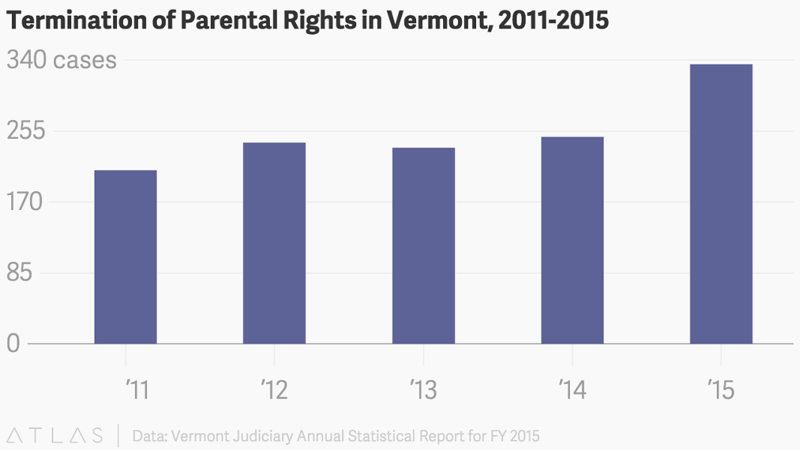 In the end, the state breaks up a Vermont family almost every day. Parents who are hooked on heroin and prescription opiates are driving an increase in child neglect cases, according to state child welfare officials and prosecutors. "It's the drugs," said James Hughes, state's attorney in Franklin County, which has been swamped with juvenile cases. "Young parents are taking care of their addiction instead of taking care of their children." Petitions for "children in need of supervision," when the state takes custody on a temporary basis, are also way up statewide. They increased from 867 to 1,252 cases over five years ending in 2015. Those filed on grounds of abuse and neglect, as opposed to sexual crimes or other factors, have increased 91 percent within the same time frame. According to the data, and the social workers, temporary cases often become permanent. The decision to sever ties between parents and children has deep ramifications. It might save lives or spare children the long-term developmental harm that can be caused by abuse and neglect. In one case appealed to the Supreme Court, a child was subjected to "unexplained non-accidental injuries in mother's care." Another case refers to a stepmother who told a social worker she wanted to "be the next one on TV for killing her kid." But acting too aggressively can be dangerous, too, if it breaks the powerful bond between parent and child when a second chance might allow a mother or father to become more responsible and keep a family intact. "Separating even a nonideal parent from a child is just a tremendous stressor, and many kids are extremely attached to parents who can be neglectful and abusive," said Dr. David Rettew, associate professor of psychiatry and pediatrics at the University of Vermont College of Medicine. Termination of parental rights decisions are difficult but ultimately must be guided by one goal, he said: "Obviously, the standard is: What is the best interest of the child?" State officials hoped that big investments in medically assisted opioid drug treatment would help addicted parents break their habits and safely care for their children. The number of people in such treatment statewide nearly doubled from about 1,600 to 3,000 over the past two years, but that hasn't reduced juvenile caseloads. "It's killing us, to be blunt," Hughes said of the backlog in Franklin County, where juvenile cases used to take up one day a week on the court calendar and now easily fill three or four. A jury receiving room is being converted into a second family courtroom and a new assistant state's attorney is coming on board to help in July, as part of a $10 million child welfare funding infusion approved by the legislature this spring to add Department for Children and Families social workers and office staff, new government lawyers, and at least one new judge. There's statewide competition for the new resources. Hughes says he needs two new attorneys, not just one, and another full-time support staffer to handle the load of child welfare cases, which are almost always driven by the same thing. Almost every case has "a substance abuse aspect to it," Hughes said. Currently there are 1,380 children in custody of the DCF, and they're trending younger than in the past: 532 are under the age of 6, up from 284 in 2013. The increase means DCF is scrambling to recruit more foster parents, including some who will go on to adopt children if the birth parents lose custody permanently. A shift in policy may also be a factor in the growing numbers. The death of two small children in 2014 caused some to question whether DCF had been putting too much emphasis on family reunification. Both children had been removed from their homes after DCF found evidence of abuse. They were subsequently reunited with their families, only to die, authorities say, at the hands of caregivers. An outside review by a panel of experts recommended reform. "DCF staff training should clearly address the staff misperception that reunification should always be pursued first and foremost," read the Vermont Citizen's Advisory Board Child Death Review Report. "DCF should train staff to assess child safety first and foremost, and to pursue reunification only when safe and in the child's best interest." Deputy DCF commissioner Cindy Walcott says the state is doing just that — without being overly aggressive in terminating parental rights. Matt Valerio has a different perspective. As Vermont defender general, he oversees the court-appointed lawyers who represent parents at risk of losing their children. "People in the field are telling me that government is taking children into custody that, five years ago, they might not have," Valerio said. Addiction alone didn't used to be sufficient justification — especially if the parent was seeking treatment. Now the state isn't taking any chances. Most of the parents facing termination of rights are poor, he added, and this makes it more difficult for them to stabilize their lives and deal with addiction. "To be perfectly frank, this isn't a legal problem at all," Valerio said. "This is a poverty problem. A treatment problem, a housing problem, a jobs problem, all arising out of poverty." Children in termination-of-parental-rights cases have typically already been removed from the parent's care for safety's sake. Often they have been placed in foster homes or with relatives who become licensed foster parents specifically to care for their own kin. Safety is not the only factor driving terminations, though. Permanency is also a consideration. Federal law strives to prevent children from lingering in foster care or bouncing from home to home, although some children still do. The law says that when children are placed in "out-of-home care" for 15 of the last 22 months, the state must file to terminate parental rights unless it can show there is a compelling reason why this is not in the child's best interest. That provision leaves room for discretion. Some advocates for parents say the state should give parents more time to conquer their addictions with treatment, since relapse is common. Others say it's unfair to leave children in limbo that can go on for years. One case that was appealed to the Supreme Court last year involved child neglect by an opioid-addicted mother who had been in and out of treatment for nine years. Balancing the need to give parents a chance and to give children permanency in an adoptive home is "a very thorny problem," Walcott said. Parents who have battled addiction know that firsthand. Skyler Browder is a former heroin addict who says she has been clean and sober for more than two years, since shortly before her little boy was born. One evening last week after her son was in bed, Browder, a 26-year-old student at Community College of Vermont, sat on the couch at her modest Colchester apartment and talked about her journey. Next to the couch, balloons tied with bright ribbons marked the boy's recent birthday. A pint-size basketball hoop stood in the living room, and the fridge door was plastered with pictures of the smiling, brown-haired tot. Browder relishes being a mother. But it wasn't always so. She gave her first baby up for adoption five years ago because she was using heroin and knew she wouldn't be a fit parent. Browder also believes the child would have been removed by the state if she had not relinquished rights. "I didn't go into any treatment program, because I really didn't want to stop," she said. "I had no desire to be clean and sober and no desire to be a parent." 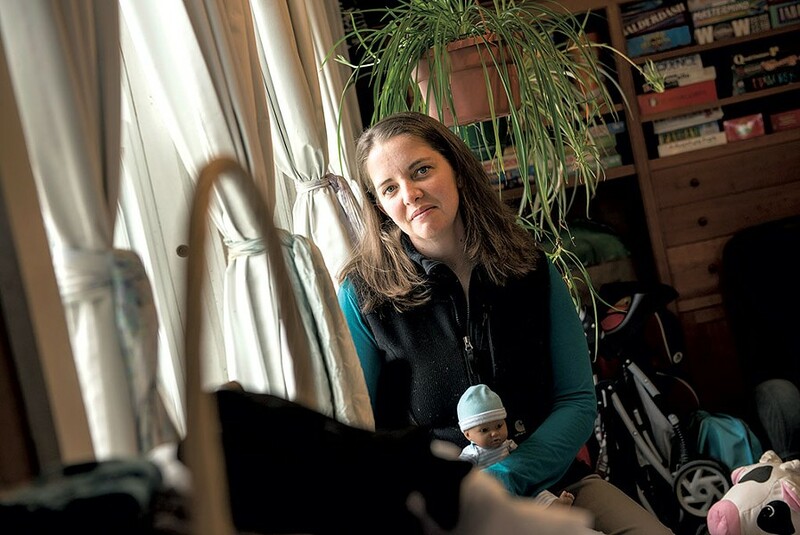 When Browder found herself pregnant again in 2013, she was ready to change. She enrolled in a methadone program, to help quit heroin and moved into a residential program at the Lund family center in Burlington a week before her son's birth. She spent 14 months living at Lund learning to be a parent and stay clean. She tapered off the methadone shortly after her son was born. Browder, a single mom, attends support group meetings four times a week and says she has divorced herself from the people who were part of her world when she did heroin. She's close to both her parents and wants to be a teacher someday. In her view, addicted parents need more assistance in the form of counseling, sober houses where they can live with their children and regular support groups. Treatment with methadone, Suboxone and other drugs is not enough, she said. "It takes a lot more then popping a pill to become a productive member of society again," she said. Not all termination of rights cases involve drugs. Sometimes other issues are a factor, including mental illness. That's how Martha Bowdish of Weybridge came to be the adoptive mother of a 19-month-old boy this spring. The state took custody of the child from his mentally ill mother when he was 5 weeks old and placed him in foster care with Bowdish, who has three teenage and young adult children of her own and has been a foster mom to more than a dozen children over the past four years. When her adoptive son arrived as a newborn, it was supposed to be a temporary placement. Then his father relinquished custody, no other relatives stepped up to care for the baby and the state filed to terminate the mother's parental rights. "In his case, nothing else was viable. And we just fell in love with him. He's been a part of our family from the beginning," Bowdish said in the kitchen of her farmhouse on Lemon Fair Road, where fresh-baked banana bread sat on the counter and a carefully written list of family rules taped to the wall advised: "Do not let other peoples' bad day make you have a bad day." In the first month that Bowdish fostered her 19-month-old, his birth mother visited the boy several times, and the two women met. "She completely loved him, adored him. I think if she was mentally stable, she could have cared for him," Bowdish said. Then the mother went nine months without seeing the baby and in court hearings gave mixed signals about what she wanted for the child long-term, according to Bowdish. "In one court hearing she said, 'I want Martha to have him.' The next court hearing she said, 'No, I want you to wait until January ... I might be able to take him by then.' The judge just said no." Bowdish loves her little son dearly but understands how wrenching it was for his birth mother to lose him. After the adoption, the birth parents have no legal rights to see or communicate with the boy, but Bowdish says she wants him to know who they are someday. She said, "I don't want to close that door for him."